The CSKT-Montana compact is the result of more than a decade of negotiations to resolve the Tribes’ claims to reserved rights within the State. A previous version of the compact failed in the 2013 Montana legislature. Following a request for a limited reopening of negotiations by Governor Bullock in early 2014, the State and Tribes negotiated key provisions relating to irrigation use and instream flows on the Reservation and incorporated recommendations from the Montana Water Policy Interim Committee following two years of review. The 2015 Legislature ratified the Compact, and the parties are working on compact implementation. The Compact awaits approval by the United States Congress, the tribes, and the Montana Water Court. The CSKT-Montana Compact is the result of more than a decade of negotiations to resolve the Tribes' claims to reserved water rights within the State. Montana's 2015 Legislature ratified the Compact (MCA 85-20-1901). The Compact is now awaiting congressional approval. 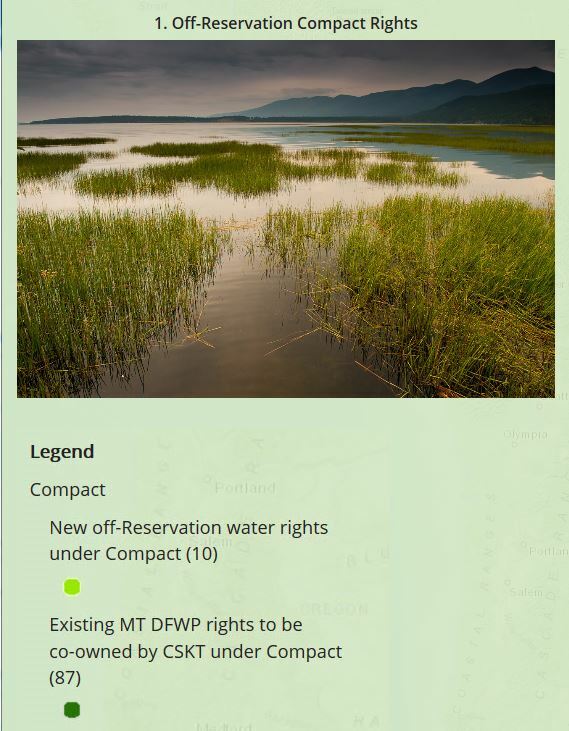 The Compact will make new water available for commercial and irrigation use, end the water administration void on the Flathead Reservation, allow for economic development under conditions of legal certainty on and off the Reservation, and facilitate the completion of the statewide general stream adjudication. In addition, the Compact establishes a technical team with irrigator representation to implement irrigation project upgrades to protect historic irrigation use and meet Tribal in-stream flow targets. One of the first steps in the implementation process is that the parties to the compact establish a Compact Implementation Technical Team (CITT). The CITT is tasked with advising the operator of the Flathead Indian Irrigation Project on the implementation of operational improvements, rehabilitation and betterment of Project facilities and on adaptive management as called for in the Compact. A Compact Management Committee (CMC) will provide policy and administrative oversight over the technical team. As of August 12, 2015, all parties made their appointments to the CITT. In addition to the CITT members appointed by the parties to the Compact, the CSKT Compact also provides for a fourth seat for the Flathead Indian Irrigation Project Operator, and also the option of a fifth seat that may be filled by a representative selected by all irrigators served by the Project should they decide to appoint one. Below are links to a cover letter and a report detailing the State's response to the Tribes' proposal for access to up to 90KAF of releases from Hungry Horse Reservoir as a component of a comprehensive water rights settlement. Below is also a link to the Bureau of Reclamation's report modeling the possible effects of the Tribes' proposal.